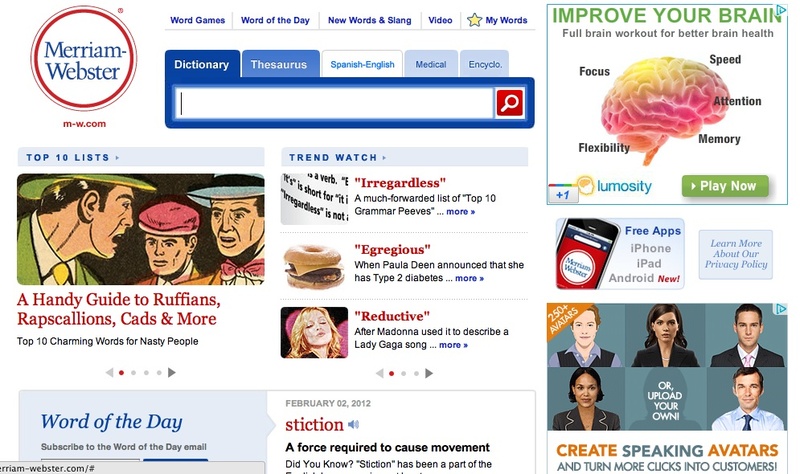 Merriam-Webster is one of the US publishers of language-related reference works. The Merriam-Webster Online Dictionary is based on the Merriam-Webster’s Collegiate® Dictionary, 11th edition. The online dictionary includes the main A-Z listing of the Collegiate Dictionary, as well as the Abbreviations, Foreign Words and Phrases, Biographical Names, and Geographical Names sections of that book, illustrations and tables. Multiple search criteria are available and differentiated by age, i.e. in the option “Merrian-Webster” for kids. Direct link and cooperation with Encyclopedia Britannica are strongly emphasized. Each searched entry results with general metainfo and good technical description plus hypertextual internal and external connections. Even if the access is open and free for a big amount of resources and functions, full access to complete editions (Collegiate, Unabridged) requires an affiliation. Many utilities and functions are available also in multimedia formats, as well as simple search features. Several trial forms are available such as the one-day free trial to the complete Webster collections (dictionaries, encyclopedia, etymologies, atlas, etc. ), the 14-day trial to the full edition of the Merriam Webster Unabridged version, or the free (only for institutions with free samples for all) 30-day preview of the 3rd International Dictionary.